Just before 10:30 p.m. on the evening of October 4, 1957, the Soviet Union launched Sputnik, the world’s first artificial satellite, into orbit around Earth. Sputnik was just a metal sphere with some antennas attached, not much larger than a basketball. All it did was send radio signals beeping back to Earth. But it passed over the United States several times a day, and there was nothing the government could do about it. The implications were obvious: Russian missiles that carried satellites like Sputnik into orbit might someday be used to launch nuclear weapons against America. The Russians didn’t stop there: One month later they commemorated the 40th anniversary of the Bolshevik revolution by launching a dog into orbit aboard Sputnik 2. They boldly predicted that Soviet cosmonauts would celebrate the Russian Revolution’s 50th anniversary, in 1967, on the Moon. U.S. intelligence analysts who studied the secretive Soviet space program feared that the Russians might indeed be capable of landing on the Moon by 1967. That raised some disturbing possibilities for American military planners: What if the Soviets claimed the Moon as Russian territory? Even worse, what if they established a military base on the Moon, perhaps even a nuclear missile base with its missiles pointed back at Earth? The United States would have no way to defend itself. The only answer, at least as far as planners in the U.S. Army were concerned, was to get to the Moon first and build a lunar base before the Russians did. Then the U.S. could decide for itself whether to put missiles on there, and whether to permit the Russians to land and build their own lunar base. And if it decided to deny the Russians their own base, American soldier-astronauts stationed on the Moon could stop them from landing. “This lunar base is needed to protect United States interests on the Moon…so that the U.S. can deny Soviet territorial, commercial or technological claims,” wrote the Army’s chief of research and development, Lieutenant General Arthur Trudeau, in March 1959. He directed the army’s chief of ordnance to “develop a plan…for establishing a lunar base by the quickest means possible.” Two months later the three-volume report for “Project Horizon” landed on General Trudeau’s desk. Beginning in January 1965, the first of dozens of rockets would blast off for the Moon loaded with the equipment, materials, and components needed to construct the base. The launches would all be unmanned. Once the materials arrived on the Moon, two astronauts would be sent there to verify that everything had arrived in good condition. Any materials damaged or destroyed would be replaced in future launches. Those first two astronauts would also verify that the site chosen for the base was suitable. If it wasn’t, they would scout alternative sites. The authors of the study estimated that it would take a total of 30 to 90 days for the astronauts to complete their tasks, after which they would return to Earth. While on the Moon, they would live in the cabin of their lunar landing vehicle. Six months later, after everything was confirmed to be in order, a construction crew consisting of as many as nine additional astronauts would be sent to the Moon to unpack the materials and begin assembling the base. The first part built would be the construction camp that they would live in while they built the rest of the base. The basic building unit of both the construction camp and the Moon base would be prefabricated “habitation units.” These would be made from cylindrical metal tanks 10 feet in diameter and 20 feet in length, about the size of a shipping container. Rather than set them up on the lunar surface, the plan called for them to be lowered into a trench that the astronauts would dig using a bulldozer, explosives, or both. After the astronauts completed work on the construction camp, they would begin work on the main part of the base by digging a longer trench at a 90-degree angle from the first trench. The remaining habitation units would be installed and buried in that trench. When the work was completed, the astronauts would move into the permanent living quarters and convert the construction camp into laboratories. Power would be supplied by two nuclear reactors that would be buried a safe distance from the base. The Project Horizon authors estimated that the base would be finished by November 1966, at which point it would be ready for permanent occupation by rotating crews of 12 astronauts, who would serve one-year stints on the Moon before returning to Earth. Project Horizon’s designers were already planning for the day when American nuclear missiles might be installed at the base and pointed back toward the Soviet Union. The base would have to be defended against Soviet attack, and for this reason considerable thought was given to the kinds of weapons that would be needed to protect it. A pistol-type weapon, one designed to work in the near vacuum of space, would need to be developed for close combat against Soviet cosmonauts. At short distances, aiming the weapon would not be much of a problem: the astronauts would simply point and shoot at what was right in front of them. But at greater distances, bulky helmets and unwieldy space suits, perhaps having only mechanical claws for hands, would make aiming the weapons difficult. For this reason, the planners decided that weapons spraying shrapnel or shotgun pellets over a wide area would be more effective than guns that fired only one bullet at a time. Volume 3 of the Project Horizon report contains an illustration of a proposed handheld fragment gun that looks kind of like a satellite TV dish mounted on the end of a broomstick. It also has an illustration of a device loaded with buckshot that could be set on the ground, pointed in the direction of enemy soldiers, and fired with an electronic trigger. Here is where the Moon’s low gravity and lack of atmosphere became an asset: On Earth, weapons of this type had a lethal range of as little as 200 feet, but on the Moon, the fragments would fly much farther, striking enemy astronauts as far as a mile away and with much greater force, since there was no atmospheric resistance to slow them down. Hits from multiple fragments, rather than from a single bullet, were more likely to defeat whatever self-sealing technologies were built into military space suits to protect them against punctures and decompression. “Certainly the greater number of punctures, the higher probability of a kill,” Project Horizon’s authors wrote. Such weapons could be fired by astronauts, or set up around the perimeter of the Horizon base and activated by trip wires and other sensors if Soviet cosmonauts ever tried to sneak up on the base. For targets ranging from 2.5 to nearly 10 miles away, a bazooka-like weapon firing small nuclear warheads was envisioned. The U.S. Army already had such a weapon for use on Earth. It was called the Davy Crockett gun, and its warheads had the explosive force of 10 to 30 tons of TNT. On Earth, the gun weighed about 200 pounds and had to be mounted on a tripod or on the back of a jeep. On the Moon, it would have weighed just 33 pounds, which might have made it possible for astronauts to fire it over the shoulder like an ordinary bazooka. With no real atmosphere on the Moon, the destructive power of an exploding nuclear bomb would not be magnified by a blast wave or thermal (heat) energy as it would be on Earth. But the warheads would still have packed quite a punch at close range, releasing enough radiation to kill everyone within a 255-yard radius of the blast. 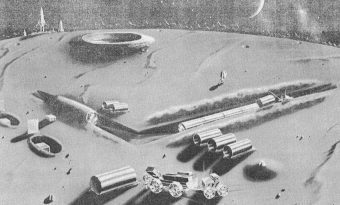 To protect base personnel from similar nuclear bombs fired by Soviet cosmonauts, bomb shelters would have been dug into the lunar soil around the Horizon base. The Project Horizon authors also proposed developing a “death ray” consisting of a beam of neutron or gamma radiation fired from a device called an electron accelerator. An alternative weapon would have used mirrors and/or lenses to focus the rays of the Sun onto invading Soviet cosmonauts, in much the same way that kids on Earth use magnifying glasses to burn ants. But military planners preferred the electron accelerator. “It would be wise to further investigate the ‘death ray’ since this weapon would not only be effective against personnel and surface vehicles but would also be effective against spaceflight vehicles for which we have provided no defense,” the authors wrote. Project Horizon’s authors estimated that building the base and keeping it supplied through the end of 1967, by which time it would have been in operation for one year, would require more than 229 rocket launches to the Moon. That’s roughly one trip to the Moon every week and a half for nearly three years. They estimated that the program would cost $6 billion, the equivalent of $50 billion today, plus another $25 million to develop the weapons that would be used to defend the base. That was quite a lot of money in 1959, but the authors argued that the amount came to less than 2 percent of the annual defense budget, and they warned that if the U.S. waited until it had definite proof that the Soviets were planning their own Moon base and then launched a crash program to try and beat them to the punch, both the cost of the program and the risk of failure would be much higher. It’s probably a good thing for taxpayers that the army never got the green light to build its Moon base, because the report’s cost estimate was drastically too low. The Apollo program was far more modest in scope, with just six Moon landings between 1969 and 1972, and a seventh attempt (Apollo 13) that was scrubbed after an oxygen tank exploded on the way to the Moon. But even the Apollo program cost roughly $25 billion (about $209 billion today). The cost of Project Horizon’s 229 trips to the Moon would have been…astronomical. The United States would soon land on the Moon, but thanks to Eisenhower, the U.S. Army remained stuck on planet Earth. Whatever small chance there still was for Project Horizon to come to fruition disappeared entirely in 1967 when the United States, the Soviet Union, and more than 60 other countries signed the Outer Space Treaty, which forbade nations from claiming the Moon, the planets, and other celestial bodies as sovereign territory. The treaty also limited their use to peaceful purposes, and banned the placement of nuclear weapons or other weapons of mass destruction into Earth orbit or outer space. And it specifically forbade “the establishment of military bases, installations and fortifications, the testing of any type of weapons and the conduct of military maneuvers on celestial bodies.” As long as the Outer Space Treaty remains in effect, the only place to see military bases in space will be at the movies or on TV. So how realistic was the threat that the Soviet Union would build a military base on the Moon? Just as American military planners had feared, in 1962 the Soviets did begin developing plans for such a base. And they kept at it until 1974, far longer than the U.S. Army spent on Project Horizon. After the Outer Space Treaty was signed in 1967, however, the military components of the base plan were abandoned. The base was just one part of the Soviets’ lunar program, which also included a plan to land a cosmonaut on the Moon before the United States. Then, when the Americans beat the Russians to the Moon in 1969, the Soviets hoped to make their second-place finish more impressive by going forward with the construction of a lunar base. Their plan for the Zvezda (Star) base bore some similarities to Project Horizon: at least one habitation module would have been sent to the Moon in advance of the cosmonauts. Nine modules in all would have landed on the Moon, some before the cosmonauts and some after, and the modules would have been connected together to build the base. Unlike the American modules, the Soviet modules would have been expandable. After arriving on the Moon in compact form, the cosmonauts would have filled them with compressed air to expand them from 15 feet to their full size of nearly 30 feet in length. The modules would also have been built on wheels, so that a special module called a tug could tow the base from one place to another like a locomotive. Like Project Horizon, power for the base would have been supplied by nuclear reactors, and if necessary the modules could have been covered with lunar soil to protect against micrometeorites and wild swings in temperature. The Soviets never did build their base on the Moon, for the same reason that they never made it to the Moon in the first place: their N-1 heavy-lift rocket suffered from design flaws that caused all four of its test launches to end in failure. One rocket blew up on the launchpad, and another exploded less than two minutes into its flight. The other two rockets malfunctioned and crashed back to Earth. Soviet premier Leonid Brezhnev canceled the program in 1974. A successor to the N-1 rocket, the Vulkan rocket, was proposed the same year but never built. By then the Soviets had decided to focus on building a reusable space shuttle in order to counter what they felt was the military threat posed by the American space shuttle. The Soviet Buran (Blizzard) space shuttle was completed in 1984 and made just one unmanned, remote-controlled flight in 1988 before it was canceled due to funding problems. 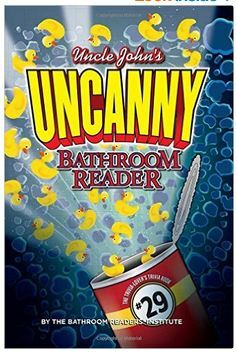 This article is reprinted with permission from Uncle John’s Uncanny Bathroom Reader. This groundbreaking series has been imitated time and time again but never equaled. And Uncanny is the Bathroom Readers’ Institute at their very best. Covering a wide array of topics—incredible origins, forgotten history, weird news, amazing science, dumb crooks, and more—readers of all ages will enjoy these 512 pages of the best stuff in print. It sort of cute how, in the 1950’s, they thought space travel would be that easy. Oh such naivete …. and paranoia all over…..